Daughter and I spent Friday evening shopping for school supplies and clothes. She has been working so much I’ve barely gotten a chance to see her, but she finally got a few days off and jumped at the chance to go shopping with me when I told her Friday was the start of a three-day, tax-free weekend — and I was buying. Of course, the fact that I was buying probably had more to do with her wanting to go than the tax-free thing, but so it goes. It was a chance for us to spend some time together, and that’s all that really mattered to me. 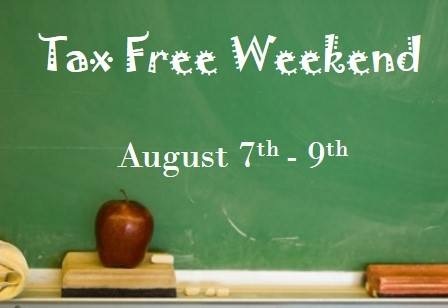 Apparently, Texas and 11 other states participate in the tax-free event. In Texas, pretty much any clothing, backpacks or school supplies that cost less than $100 qualify. It makes sense that I hadn’t really heard of this tax-free event before because Wisconsin (the state I used to call my home) doesn’t participate. With a more than 8 percent sales tax where we live in central Texas, the savings aren’t huge. But, hey, any little bit helps, right? And several stores also had great sales on top of the tax-free thing, so daughter and I made out pretty good. She got notebooks, folders and the like for school (which begins Aug. 24 here) and we both got a few outfits and a pair of shoes. I hadn’t really planned on buying anything for myself, but that’s the way it usually goes for me. When I go shopping with the intent of buying something, I can’t find anything I like. But when I go shopping with/for someone else with absolutely no plan to buy anything for me, that’s when I find things I like. Go figure. Given that clothing is tax-free all weekend, I’ve got half a mind to go out again. But, of course, if I do that, what’s the chance I’ll actually find something I want/like? Ah, geez, that explains all the crowds! I usually avoid this weekend, but my child needed clothes. Oh well. At least I got an 8% discount.